Today we have an anonymous submission from a gutsy author, titled Inside Moves. Read and enjoy. I’ll be on the flip side with my feedback. Join in the discussion with constructive criticism for the author. The ambulance screeched around the corner—its light bar flashing and siren screaming—toward Santa Barbara General Hospital’s emergency-room entrance. An older couple sitting on the bus-shelter bench at the corner was startled by the sounds of the vehicle, along with the knowledge of what that meant. Desperate to keep the man alive, EMT David Ortega kept his eye on the heart-rate monitor for any changes to Bobby Wainwright’s vital signs. “We’re losing him!” he yelled to his partner, Tom, who pushed the accelerator of the ambulance. David felt the ambulance lunge forward. Tom liked to drive fast when the siren and flashers cleared his path. Regaining his balance, David prepared to do CPR while speaking to Dr. Richard Kiersten through his headset. The doctor was standing by in the OR, awaiting their arrival at SBGH. “Give him Narcan IC,” he instructed David. David hated giving intracardiac injections because they could produce complications. Besides that, just the idea of stabbing someone in the heart with a long needle was ugly. But he did it anyway. With nothing to do but watch the monitor and the patient, David read the notes Tom had taken at the accident site. Bobby Wainwright. Just a few years older than me. Huh? Owner of Wainwright Erectors. Not from around here. Bet he makes a ton more than me. Accident on the job…Man, something really big fell on this dude. Goose bumps jumped out on his arms. No matter how much he makes, I sure don’t want to be him right now. At the emergency entrance, David and Tom prepared Bobby for the operating room and Dr. Kiersten. As David jumped out of the ambulance, he saw an elderly couple at a bus shelter watching him. The old lady looked scared to death. Dear God, don’t let her suffer a heart attack before I get this guy into the OR. The first responders had brought Bobby to the hospital closest to the construction site where he had been injured. Right now, it didn’t appear that this hospital was close enough. There is nothing like a speedy ambulance ride to start an exciting action scene and get the blood pumping for a reader. This author’s instincts to begin the story there has merit, but the omniscient point of view (or author intrusion/head hopping) had me distracted. A.) POINT OF VIEW – From the first line, I’m wondering who is watching this ambulance as it screeches around a corner. The older couple waiting for a bus seem almost caught off guard and startled by its sudden appearance. From their reaction, more author intrusion follows when an unknown narrator estimates the older man’s age. 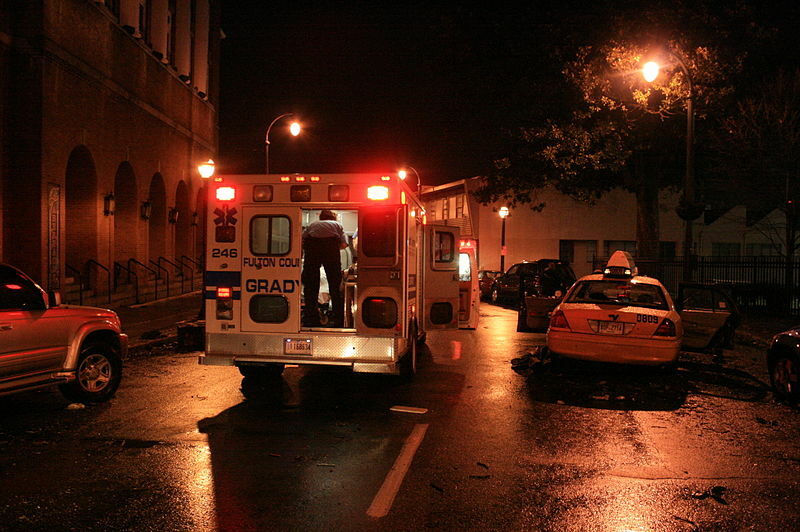 After his dialogue line, this unknown narrator answers his remark of “…we might know whoever’s in that ambulance” with the line – But they didn’t. The action and pace of this intro is diminished by the insertion of this couple too. They add nothing to the scene. From the point where the older couple are left behind, the author tried to stay in the POV of David but veered out big time when David, the EMT riding in the ambulance, can somehow “see” the doctor he’s listening to on his headset with this next line – The doctor was standing by in the OR, awaiting their arrival at SBGH. I suspect that rather than this author deliberately using Omniscient Point of View, there is more “head hopping” going on here. Recommended reading on POV – Here is an excellent prior post from TKZ’s Joe Moore on Narrative Voice that explains more about Point of View and the author’s voice. B.) WHERE TO START – I would recommend this intro start with David the EMT and stay within his head, whether he’s a main character or not, at least until we get through the action and settle into the story. Begin with the line, “We’re losing him!” he yelled to his partner, Tom, who pushed the accelerator of the ambulance. Get the reader to feel the jostling ride as David is on his headset talking to a doctor at the hospital, as his patient is dying. C.) RESEARCH – There is no short cut for research. If the scene calls for medical knowledge, any reader knows some jargon and can discern what is believable. Leaving out the details only highlights that the author has not done the research. 1.) Get the medical right – I would advise giving more medical detail on what David sees. Are there broken bones, collapsed lung, patient in shock, etc? David is an EMT and would know more than is shown. His objective should be to stabilize the victim enough for the ride to the hospital. There appears to be an accident but a medical person would look at the injuries and not be focusing on the accident so vaguely. This is obviously an attempt to introduce backstory in a “telling” fashion. If these details are necessary, it would be best to include them in dialogue, maybe as the EMT speaks to the doctor. But focus on the resulting injuries. I’m no medical person, but I can’t imagine that CPR is how an EMT would describe resuscitation. They have drug remedies (medical therapy), airway management, or equipment to use, like defibrillators. 2.) Mystery elements draw readers in – I’d suggest revealing the patient’s condition through dialogue, with David being the POV character. (One POV per scene is highly recommended, otherwise it reads like head hopping and would be a red flag to editors and agents.) Is there conflict between the EMT and the doctor? Is David resentful of the man? Does David see ambiguity between the patient’s condition and “the accident” explanation? Readers can be drawn into a story by elements of mystery. Have patience with laying these out. Raising the mystery is enough and it will foreshadow things to come. 3.) Drama builds on the risky stakes and tension – Where is the drama when the heart stopped and flat lined? Too much is missing and it is apparent that the author has avoided the details needed for this scene to be believable. 4.) Suggestion – I would do the research and include some details in David’s dialogue to make this work, but if the author didn’t have a desire to do this, I would suggest having the POV be in the head of someone who is brought on the ambulance who is an unreliable narrator and doesn’t have a medical background. This could be a loved one or a co-worker, but if David is a main character, I wouldn’t make the first scene about a secondary character that won’t be important to the story. D.) RESEARCH RESOURCES – Below are a couple of good resources sites for medical and crime scene research. 1.) Medical – Whenever I think of medical research, one name pops into my head and I have his books in my research library. Doug P. Lyle, author. He has written many non-fiction books on forensics and medical research for writers and he’s gracious with his replies on his website. Look for his books and contact info HERE. As David jumped out of the ambulance, he saw an elderly couple at a bus shelter watching him. The old lady looked scared to death. Dear God, don’t let her suffer a heart attack before I get this guy into the OR. OVERVIEW – The fixes on POV and proper medical research can be done. That’s the good news. There are no shortcuts for solid research when the scene is a medical one. The author could find a non-medical character to insert one POV for the scene, but a better scenario would be to make the scene believable with the proper research. If the focus is on the emotion of an EMT about to lose a patient, the medical could be woven into the scene without going overboard. (Note: Less is more – a regurgitation of all your research can be tedious and boring to a reader. Moderation is key.) But get the lingo right and the sequence of events in proper order so the scene is believable. Show how the stakes are high and focus on the humanity of the EMT in a life or death situation and this author will have the reader turning the pages. Anything to add, TKZers? What had the author done right? What would you recommend for improvements?